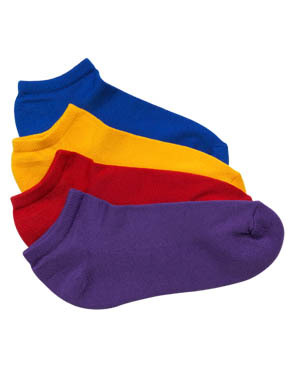 Microfiber anklet cheer sock made of 98% Nylon/2% Lycra Spandex offers the feel of cashmere with the durability of acrylic in a ped sock styling. Special stretch fabric fits almost any size from ladies 5 to men's 14. Available in all school colors with no minimums. Special order colors of lime, fuschia and grey can be purchased with a minimum of 12 pairs.